Pauline Nissen, age 97, of Aurora, passed away on Tuesday, July 4, 2017 at Memorial Community Care. Funeral Services will be held at 10:30 A.M. Saturday, July 8th at St. John’s Lutheran Church at Kronborg. Interment will be at the St. John’s Lutheran Cemetery at Kronborg. Visitation will be 5 – 7 P.M. Friday at Higby-McQuiston Mortuary in Aurora. Memorials may be made to St. John Lutheran Church at Kronborg. Condolences may be e-mailed to the family through the mortuary website at www.higbymortuary.com. 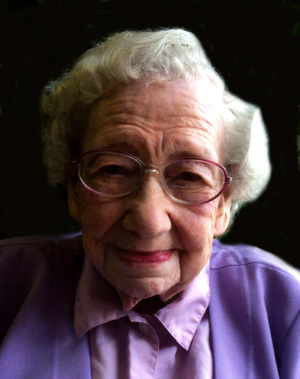 Pauline Ann Nissen, the daughter of Adolphus and Leona (Backes) Norgard, was born at Gering, Nebraska, on June 19, 1920, and passed away at Aurora, Nebraska, on July 4, 2017, at the age of 97. Pauline grew up and attended school in Arnold, Lexington, and Dannebrog, Nebraska. She worked at the Ordinance Plant in Grand Island, Hesteds in Grand Island and at Safeway in Central City. Pauline married Harold Henne and they had one son, Donald. On June 29, 1945, she was united in marriage to Delmar A. Nissen and had two sons, Gary and Rex. They farmed on the family farm for 30 years in the Kronborg area. They retired in 1975 and moved to Aurora. During those years she enjoyed being a homemaker and gardener. Delmar passed away on February 3, 1983. Pauline moved to Memorial Community Care in 2009. She led ladies coffee twice a month, delighting others with her wonderful articles and lively stories. She was baptized and joined St. John Lutheran Church at Kronborg in 1946. She held many offices and served as a church secretary for 48 years. Pauline belonged to Guild, Ladies Aid, Kronborg Fellowship, and Sew n Sews. Pauline was a member of VFW Post 4993 Auxiliary and also did a great deal of volunteer work for Blood Mobile, Memorial Hospital and Hamilton Manor by sewing for many of their needs. Pauline’s hobbies and interests included butterflies, birds, crossword puzzles and refinishing old furniture. She loved to dance, sew and play cards. Pauline was an outgoing person and was blessed with many close friends. Those who preceded her in death were her parents; husband, Delmar; two sons, Donald Henne and Gary Nissen; 6 sisters, Marcil Mae Norgard, Bonnie Carlson, Pat Stuart, Dorothy Brown, Shirley Martin & Barbara Burke and brother, Bob Norgard. Remaining to cherish her memory are her son, Rex (Barb) Nissen of Aurora; daughter-in-law, Mary Ann Nissen of O’Neill; 7 grandchildren; 11 great-grandchild; 4 great-great grandchildren and honorary grandchildren, Michaela Dahlke of Hubert, North Carolina and Alicia Elson of Grand Island and other relatives and friends.